Light at the End, Mona Hatoum, 2002. Hatoum demonstrates that color can have multiple and shifting meanings. A single color can have multiple and shifting meanings. Mona Hatoum (1952) is a London-based artist of Palestinian origins. Hatoum uses color to emphasize the intensity of her experiences and to suggest wider political meanings beyond her personal experiences. The installation Light at the End (2002) consists of an iron metal frame and five electric elements. It represents a dark tunnel with red, orange and yellow light at the end. This colored light seduces the spectator, as it appears warm and appealing, in contrast to the hostile darkness of the tunnel. However, the seductive color is a trap. Only when the spectator moves closer does the colored light reveal its real character as electric and dangerous. The warmness of red is transformed into the violent redness of blood. The installation is a reflection of both Hatoum’s personal experience and a more universal experience of living in exile. Hatoum’s Palestinian parents had been forced to live in exile by the Arab-Israeli conflict. In 1975, war broke out in Lebanon and Hatoum, on a visit to London, found herself exiled in the United Kingdom, unable to return to her home country. In Light at the End, the multiple meanings of red, orange and yellow light that contrast with the darkness of the tunnel refer to the appeal of the home country and Hatoum’s experience of living in exile, addressing the violent character and the instability of separation. The Mexican Cage, Mona Hatoum, 2002. The friendly colors of the cage work in contrast with the unfriendly nature of the cage. 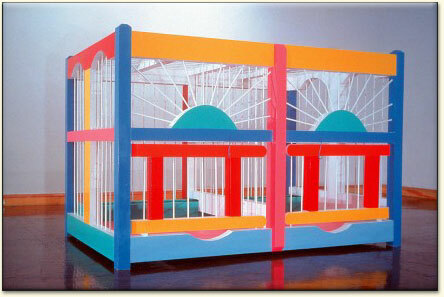 Hatoum’s The Mexican Cage (2002) represents a colorful birdcage. The work suggests a metaphoric connection between a caged canary and the life of a Mexican factory worker. How does The Mexican Cage suggest tension? Do you think that the “friendly colors” of the work contrast with the object that is an “unfriendly” cage?